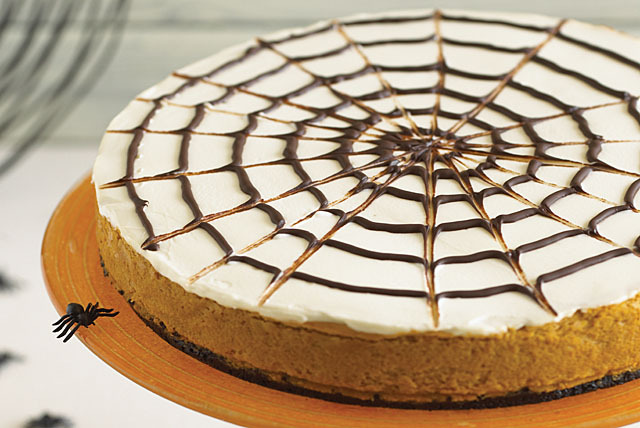 Dress up a classic for the season when you try the Spider Web Drizzle Pumpkin Cheesecake. Canned pumpkin and pumpkin pie spice team up to give this drizzle pumpkin cheesecake its autumnal appeal. Try the ol' toothpick-through-the-drizzle trick for the spider web effect. Combine cookie crumbs and melted butter; press onto bottom of 9-inch springform pan sprayed with cooking spray. Microwave chocolate and 1 tsp. butter in microwaveable bowl on MEDIUM (50%) 30 sec. ; stir until chocolate is completely melted and mixture is well blended. Drizzle over cheesecake in spiral pattern. Starting at center of cheesecake, pull toothpick through lines from center of cheesecake to outside edge to resemble a spider's web as shown in photo. Refrigerate 4 hours. Looking for a dessert to make for Halloween? This special-occasion dessert is sure to fit the bill since it makes enough to serve a crowd of 16. For easy drizzling, pour melted chocolate into small resealable plastic bag. Cut small piece off one bottom corner of the bag. Gently squeeze bag to drizzle chocolate over cheesecake as directed. Reduce oven temperature to 325°F if using a dark 9-inch nonstick springform pan.